Despite what they call themselves, there were a lot more fascists on the street than the EDL, in fact they outnumbered the EDL considerably. seems to have been completely hijacked by the IFE-Respect-SWP-UAF agenda. It would be very interesting to know what dis-information was being spread by the UEE/UAF meetings. Incidentally this statement on the East End Pride website suggests that “hidden agendas” were at work right from the inception of the affair. •	Thankfully the event on 2nd April has been cancelled. (http://goo.gl/AG8cm). There will be an inclusive LGBTQQI Pride Event Organised by Out East in September. As you can see ‘Joe’ confirmed the original East London Pride event organised by Out East, was not affected by the ‘EEGP’ EDL revelation and cancellation. Oh, I personally heard Terry Stewart, an organiser of East London Pride speaking on Saturday and talking about the Pride event that is coming up. Isn’t Terry Stewart also part of Rainbow Hamlets? No real confusion “Anon”. Surely the East London Pride event is an annual thing. The whole point of denying the EDL a chance to march through the Borough was to show we could deal with Islamist inspired Homophobic attacks ourselves and did not need the assistance of outsiders. To lose the confidence of the key Gay, Lesbian, Bi-sexual & Transgendered organisations at this critical time (whatever Cllr. Shahed Ali says about it all being about the Mayor) is a total fail. Anyone would think that organisations like the IFE have a problem with homosexuals, and the likes of United East End and UAF (dispite the lipservice they give to equality of sexual preference) don’t have the guts to confront them. Perhaps they would prefer the LGBT types to be less visable (in a closet maybe)? Terry Stewart, from campaign group Out East, said, “Islamophobia and homophobia are two sides of one coin. The EDL try to argue that all Muslims are homophobic. Reply to Anon. The statement of Rainbow Hamlets in Teds original blog entry is clear. They were not officially participating. Anyone who did attend did so in a personal capacity. The presence of a representative of Rainbow Hackney is irrelavent. what is yours? Police confirm that most Homophobic attacks in Tower Hamlets are commited by Asian youths. So unless you are suggesting the BNP or missionaries from the Westboro Baptist Church are influencing local Bengalis I’d say the likes of Islam4UK and Muslims Against Crusaders are the most likely inspiration. You are unlikely to see me at a Gay Pride event. However be prepared to meet some of my political comrades that swing that way. Do introduce yourself, we would all love to see the real face of “Onan”. Clearly Peter Thatchell wasn’t wearing his glasses if he didn’t see other “visible” gay people or may be he’s pursuing his own political agenda? When I first started investigating the threat from Political Islam (the Islamo-Fascist political creed rather than the Muslim religion) immediately after 9/11 it was Peter Tatchell’s website that provided the most informative and disturbing content. My political convictions are widely divergent to those of Peter Tatchell, but in my view he has done more than any Gay Activist to promote not only Gay Rights but wider issues of Human Rights and Freedoms. The problem is that the SWP and their UAF muppets prefer their gay activists to be plastic blow-up’s or cardboard cut-outs that can be deflated or folded away whenever there is the need to get close and dirty with the IFE or any other bunch of bearded bigots. If the LGBT community were “visible” at the anti-EDL counter demo please provide links to the images or video’s of Rainbow flags, LGBT teeshirts, badges and banners that I would expect to be on display. I’d even accept a picture of a leatherman in a pair of backless chaps if that is all you have. Firstly, I would like to correct you’re incorrect photo caption. The photograph you refer to was not taken after the march had ended; it was taken at approximately 2.00pm at the Holland Estate, just metres away across the boundary of our borough where the EDL demonstration was taking place. I together with several members of the council were also present. Members of many different organisations inclusive of the IFE and the general public, with faith not being a barrier, came out to rightly protect their community from the filth and hatred that is the EDL. I see no reason as to why you feel it is not appropriate to communicate with all members of our community. Are you suggesting that the IFE is not worthy for example, of working hand in hand with Rev. Alan Green? I further fail to realise how Rainbow Hamlets decision not to call for mass participation, just upon the eve of last Saturday’s anti-EDL demonstration, had anything to do with the obvious mass participation of people from all groups and faith in Tower Hamlets. I assume and hope that their decision coming late on Friday evening did not accumulate to Rainbow Hamlets officers spending the entire night ringing their members to tell them to stay away merely because they perhaps were not consulted? Surely the greater issue here was the threat of the far-right EDL coming into our homes, rather than who appears upon the support list? However more intriguing is your dissatisfaction with Mayor Rahman and the strong leadership he obviously volunteered pro-actively to delivery on the day. 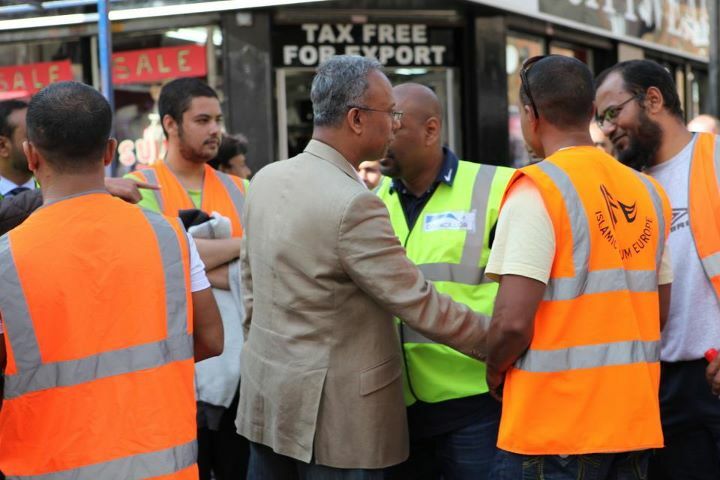 From the early hours of the morning, Mayor Rahman together with his Cabinet and office team patrolled the entire area on foot, not as a gesture of confrontation towards the EDL, but because our electorate deserves to know we are here together with them. We did so because we believed that regardless of the position sadly the majority Labour group took to advise our residents and themselves to stay locked up in their homes, it would never be the case that young people in particular would take notice. From experience, we know that it would be extremely unfortunate if the provocation of the EDL led to violence on our streets with our young people being criminalised and subsequent victims in defending their fundamental right to enjoy an equal role in a civilised society as British citizens of Muslim faith. That is why we felt as community leaders that we would be best placed to ensure we co-operate with the wonderful work of the police operation on the day, and seek to dampen potential incidents of violence between our young people and the fascist EDL members that sought to come uninvited onto our streets for simply causing trouble. The fact that more than 44 arrests were made on the day consisting only of EDL members demonstrates the fact that they are simply nothing more than a bunch of hooligans who did come to roar the evil flames of hatred and violence on our streets. I would like to use this opportunity as a ward councillor of Whitechapel, as all the disruption did take place mainly within my ward, to thank our young people in particular for the tolerance they demonstrated, and to all our residents for the unity amongst our multi-ethnic, multi-faith communities this day clearly celebrated. I felt proud to stand shoulder to shoulder with my two ward colleagues, Cllrs. Abdul Asad and Aminur Khan, and of course with Mayor Rahman to ensure our residents felt safe and not vulnerable to attack. They are still working their way through the Police Overtime sheets Ted. Certainly not even a drop in the ocean in comparison to the cost of taking our country to war in Iraq which not only has ongoing financial consequences, but unmeasurable loss of life for families that have lost loved ones for a cause I personally believe was fabricated by Bush. We now all know Iraq had no WMD, although some of us not blinded by the media knew that to be the case at the time. When the probability is high of our homes, property and lives being in danger of getting attacked, the government of our country via our police force has a duty to protect such. This did not happen during the recent riots and I certainly do not want to see any resemblence of a repeat episode. What was the evidence for the EDL possibly entering people’s homes and looting? For my previoous post Ted, can you please put my title in as I forgot to mention it so as to avoid confusion! @Shahed Ali. I can’t believe we are paying you out of our Council Tax to make such mentally deficient statements as that. Why don’t you go the whole hog and tell us that 9/11 was an inside job or done by the “Jooo’s”. What have recent events to do with the destruction of the Baathist dictatorship and the establishment of another Democracy in the Middle East. Unless of course Lutfur Rahman is now comparing himself to that other “misunderstood Socialist” Sadaam Hussein? Incidentally what will “Your Mayor” be doing to commemorate 9/11? Remembering of course that 67 British citizens perished, together with a further 6 Bangladeshi’s. With regard to cost local obection to having the police protect the The shenigans of the Blackshirts in the 30s led to Bethnal Green Borough Council propse witholding the rate for the Metroplitan Police. Though on Saturday the police presence saved the day & were worth the cost, but it is a pity that the EDL & UAF can’t be made to make a contribution for their day’s pleasure. BTW I came home to find a flyer from the Met on my doormat. They think weapons might have been involved in the coach incident by the EDL or UAF (they don’t say who or what sort of weapons). But if anyone was going about tooled up with guns / knives / iron bars etc we should be grateful that thanks to the police (and stewards) it did not escalate into mayhem & serious injury. Yeah, it’s different when it’s the safety of Muslim people, isn’t it Councillor Ali? When it’s gay people being attacked or harassed or poster campaigns to cleanse them from Tower Hamlets, neither the Council nor the police wanted to know, and nor was there any demonstrative solidarity from the left. You transparent, bigoted scum.